I have just got back after a really busy day. But it wasn’t busy in the usual sense. For any that don’t know, I run a business – a small web design and marketing agency. So most working days are busy – whether I’m doing design, or coding, or supporting my staff, I expend a lot of my ‘spoons‘ just as a normal state of affairs. 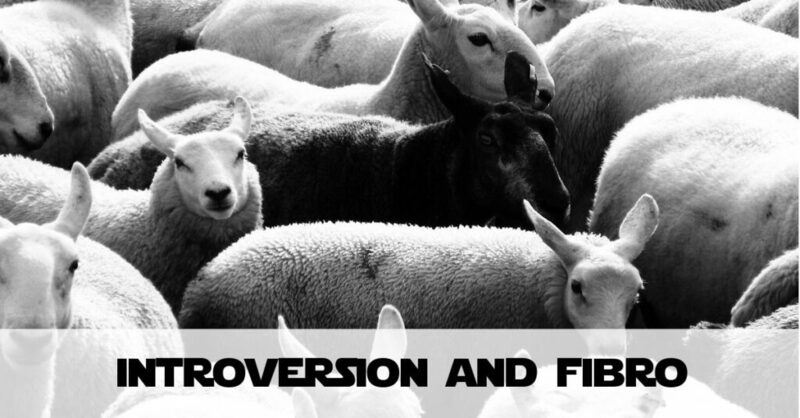 In a society that favours the outgoing, confident people and in a business which attracts those that, at least appear, super-extroverted, being an introvert can feel like you’re the ‘black sheep’ in the world. I struggle at Networking Events, conferences and exhibitions because the expectation is you need to be outgoing and approachable. Approachable I can do, outgoing is somewhat of a challenge. So what made today so different from a normal busy day? Most Tuesdays we make a point of meeting with the whole team – which in a small business really matters. Apart from a change in plan (which aren’t great for my Fibro-addled brain anyway) today was unusual in that I had an additional meeting this morning. Extroverts gain energy by spending time with other people. Introverts gain energy by time alone. And that’s definitely my experience. This morning’s meeting was with a person I hadn’t met before – which takes a shedload more concentration, effort and spooons than speaking with someon I know. Most initial meetings like this last an hour or so, which I can usually quickly counteract. But this meeting went on for pretty much three hours. I was already getting low on energy after 2 hours and I always feel self-conscious taking medication in a meeting with a new person and my neck and head were hurting. Admittedly the meeting went well all things considered. But I had lost all my energy in my interactions with this new person. I then went into our weekly team meeting (6 of us in today) where I interacted with everyone. I had about 1/2hr between my morning meeting and this one. We finished about 4.30pm, meaning I had been interacting with people for over 5hrs today! If I was a socialite, or an extrovert, then that would be an ideal day, but in pain and being more inward-looking made this a real challenge. I love dealing with people, but being an introvert and a Spoonie is a harsh combination because it just leaves me feeling drained. Fibro can be quite isolating at the best of times, and I have met so many people on Twitter who can’t hold down a job and in that respect I am blessed. But meeting, or interacting with, loads of people is overly tiring. So how can you manage your Fibromyalgia if you’re also an introvert? Plan People Time Ahead: This is hard, because life is unpredictable, but if you can plan for one ‘social’ situation per day, maximum. Today was unusual because usually I will only have one meeting planned per day. Celebrate Survival: I have to ‘pat myself on the back’ today. I survived. Yes, my pain is really high and my energy is really low, but I did manage all those interactions. Plan for Adequate Rest Time: I had thought I could work on a personal project tonight, but no, I have to rest. Good quality sofa time and hopefully a bit of quiet time too. To ‘gain energy’ for tomorrow I need to stop trying to be productive. Remember – Introversion is not a criticism of your character: Not long ago I referred to myself as an introvert to one of my friends and she told me ‘not to put myself down’. Being an introvert is not an indictment on your character – it is part who you are and that is fine. Be peaceful being who you are. I hope this resonates with someone here – feel free to share your experiences in the comments. Let me know what you think – and if you have survival tips, let me know! Well, I googled: introversion and fibromyalgia and your website was the most apropos. I am not working due to the illness, and I find it somewhat isolating. However, it is ok because I have more control over how much time I spend with people. Thanks so much for sharing your story. I now have my own FJ Goodies - two sizes of mugs and a t-shirt too. More to come! Fibro Jedi is grateful to have the support of 15 Patrons which helps me to keep making new things here! To see what benefits a Crew-Member receives please Click or Tap Here. Thank you! You Behind the Illness – Who Am I Underneath the Fibromyalgia? If you’d like to contribute a gaming or health guest post, please get in touch via Twitter or Facebook! My content will always be freely available. But it would really help me and my family if you could whitelist my site in your Adblocker. Thank you! Find Out More Got It! Streaming Now, Come Join In!